Brown Bear ammunition is manufactured by the JSC Barnaul Machine Tool Plant, the premier ammunition facility in Russia. Well-known for producing high-quality, precision-engineered ammunition for the Russian military, Barnaul also offers reliable and affordable rounds for civilian use. 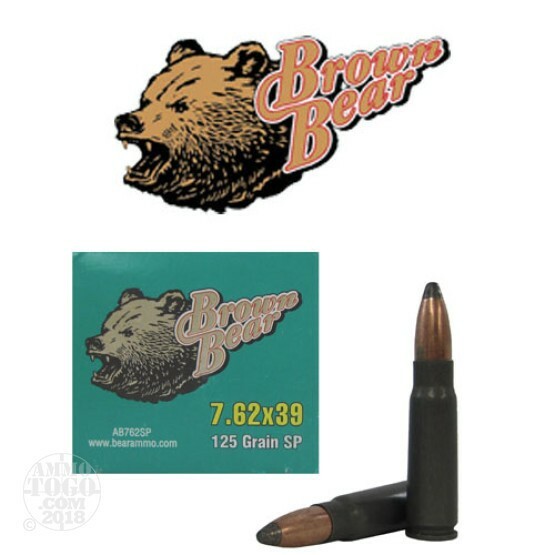 Ideal for stocking up, this package contains 500 rounds of Brown Bear 7.62x39 ammunition. Each round is loaded with a 125 grain soft point projectile. The projectile features a soft lead core with a bimetal jacket that may contain steel. Designed to expand on impact, these soft point bullets are an excellent choice for hunting. This ammunition is new production, non-corrosive, Berdan primed, and features a polymer coated steel casing. Each cartridge is sealed for extra moisture protection, making them ideal for long-term storage. Polymer coated steel delivers smooth feeding, function, and extraction, especially when compared to non-coated steel loads. Each round produces a consistent muzzle velocity of 2445 feet per second. Loads will attract a magnet and may not be permitted at some gun ranges. Don't buy this bullet for a Ruger. And understand clearly that there's no polymer in the soft point. I recently purchased 500rds of this ammo and went to the range. I shot 200 rounds through my rifle and did not have a MFR or a jam. I expected to have a bit of cleanup to do, but the rounds were rather clean and the good basic cleaning of the weapon was all that was needed. I gave it a five because it was cleaner ammo than Wolf and was consistent. It is a very good bargain at this price for range shooting ammo. I will but more, but may upgrade to the Silver Bear FMJ ammo. Even my wife had fun shooting the rifle at 100 - 200 yards targets. ATG provided great service and delivery as always!